For the last ten years, Iceland has been the world’s largest electricity producer per capita. The Icelandic generation is much higher (per capita) than in any other country. Norway comes in second place, generating close to half of the electricity per capita of that of Iceland. The Icelandic annual generation is close to 54 MWh per capita, while Norway generates close to 26 MWh per capita. Other countries on the top-ten list of the world’s largest electricity producers per capita are Canada, Kuwait, United Arab Emirates (UAE), Finland, Sweden, United States of America (USA), Qatar and Bahrain. Most of the countries on the top-ten list of the world’s highest electricity producing countries per capita generate most or all their electricity from fossil fuels (gas and coal). However, both Iceland and Norway produce close to 100% of their electricity from renewable sources (both countries draw from hydroelectric power, but Iceland has a unique energy source in its geothermal power). Canada, Finland and Sweden all have extensive hydropower sources and utilize them for electricity generation. 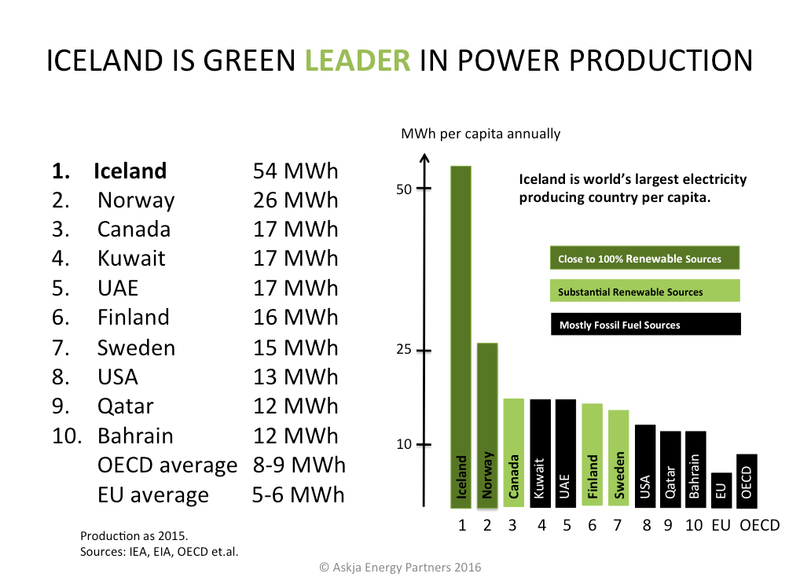 Thus, they might be described as semi renewable electric producers (thus marked with light green color on the graph, whereas Iceland and Norway are marked with dark green).